Actually, the verb that will be added to her résumé is Chopped, because the USWNT legend made it all the way to the final round of the show's Tournament of Stars before losing to former Sopranos actor Michael Imperioli. 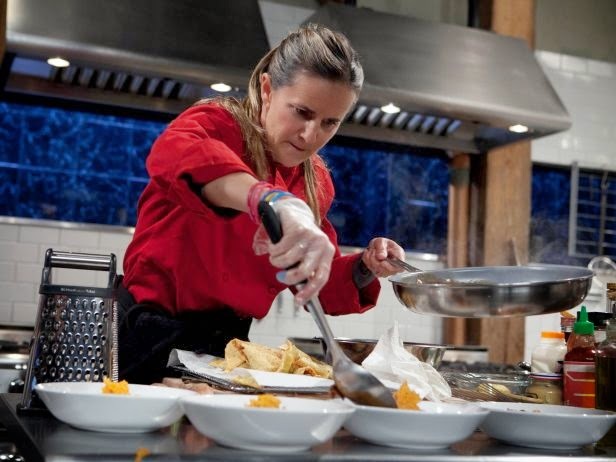 Though she narrowly missed winning $50,000 for her charity, the Bay Area Women's Sports Initiative (BAWSI), Brandi Chastain showed a lot of guile in that pressure-packed kitchen. Hey turtle, go get my turkey pot pie, you stuttering p&@k ya!!! Greg - While your busy with all of your MLSsoccer articles, I have to look at Brandi Chastain every time I visit the blog. Let's get something new up, eh? Awww. I have a large post that is nearly ready, so have a glass of root beer and relax. ...19 hrs later. NSC withdrawal kicking in. Root Beer is not strong enough for this. Time to bust into the rum and Zedd-Clarity on repeat.